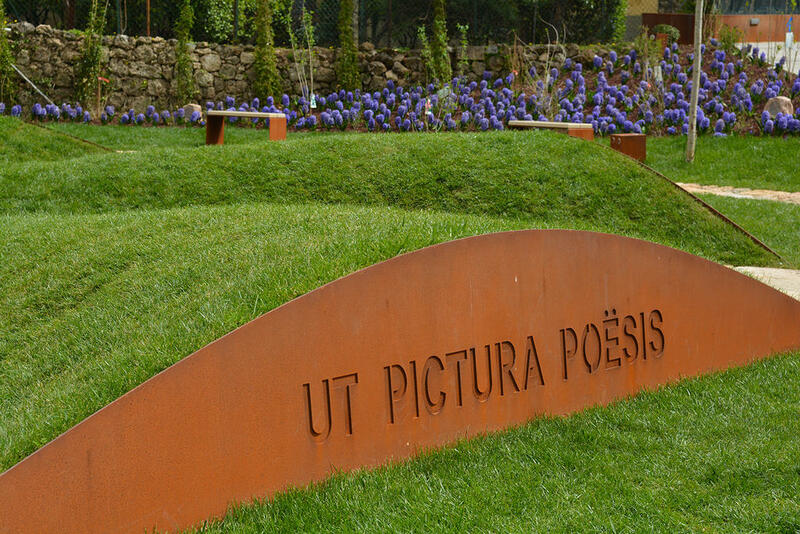 2015/2016 - Township of Massa Marittima (Tuscany) PERMANENT INSTALLATION. 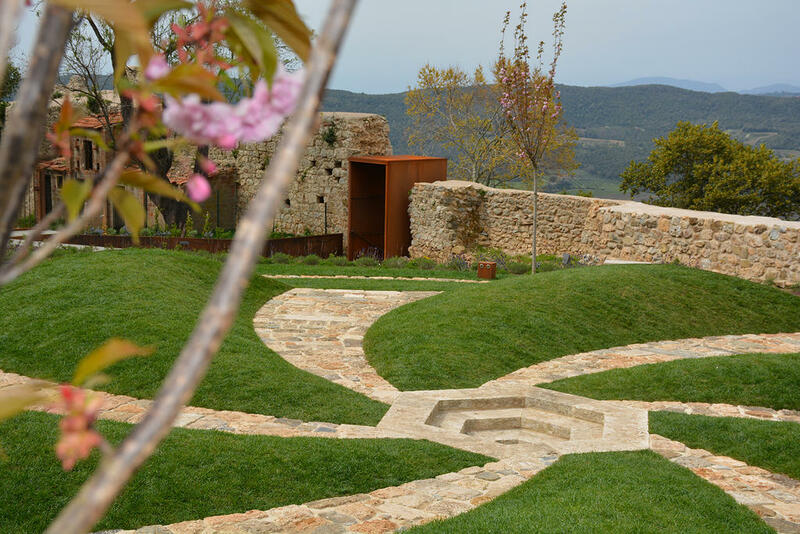 Materials: stone, terrain modeling, lawn, cor-ten, new plantings, audio, perfumed essences. Dimensions: m 33 x 28. 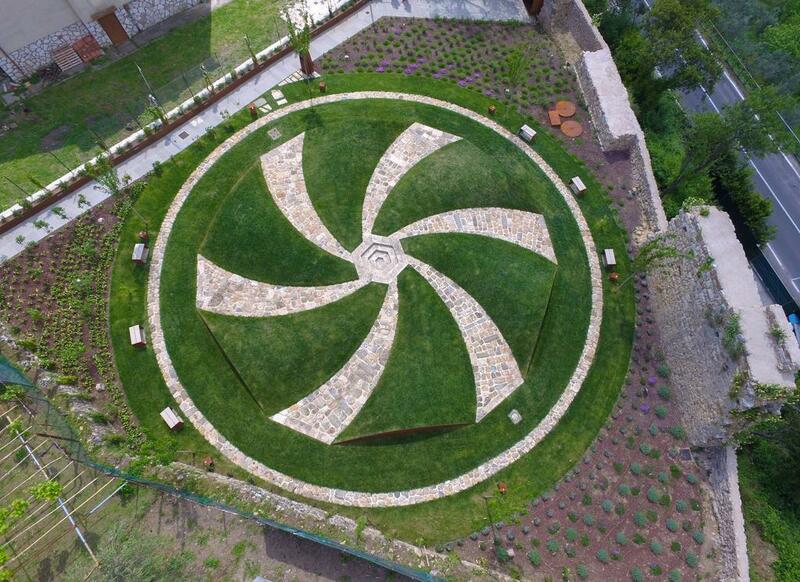 Special mention in the XVII edition of the Prize “The City for the Green” (urban green section). 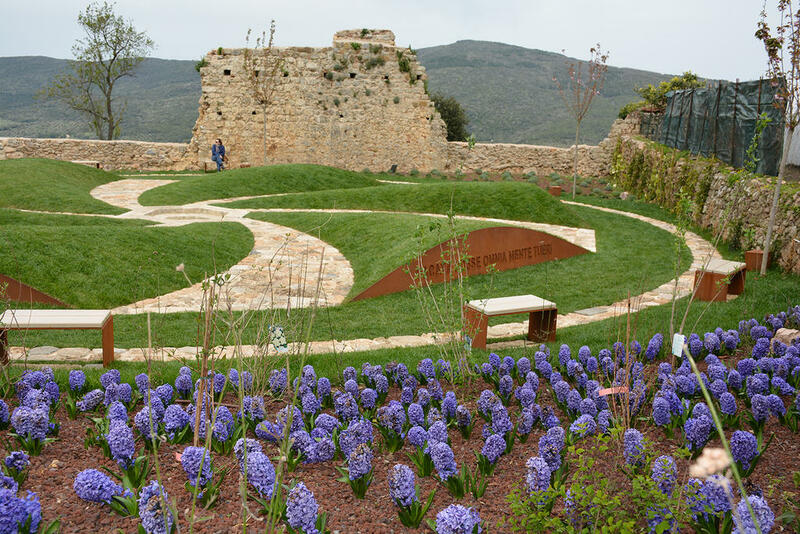 A new “artist’s garden” built in the township of Mass Marittima in order to enhance an area closely connected to the ancient walls of the incomparable medieval center. 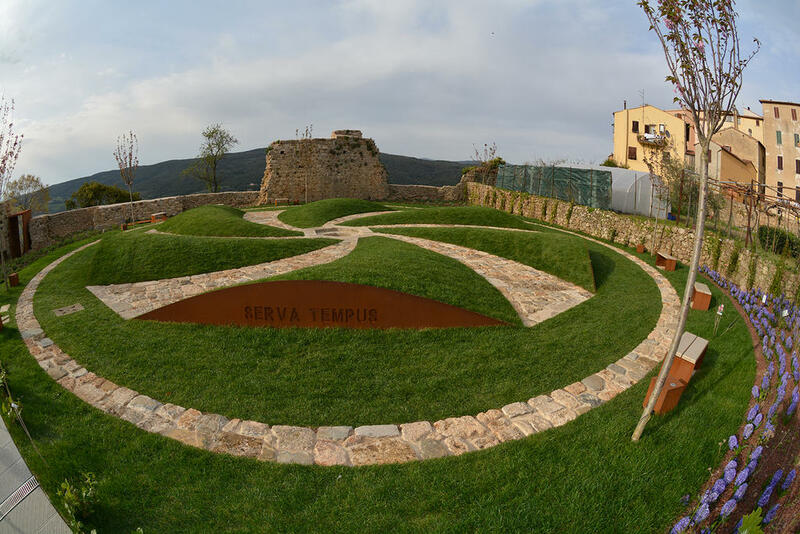 With an archaic wisdom of the “decumana” (the east-west orientation of roads), the artist takes possession of the area and, in full respect for the archaeology of the site, has designed a “green work” as the artist loves to define her sculptural gardens with their exuberant environmental impact and energetic artistic value. 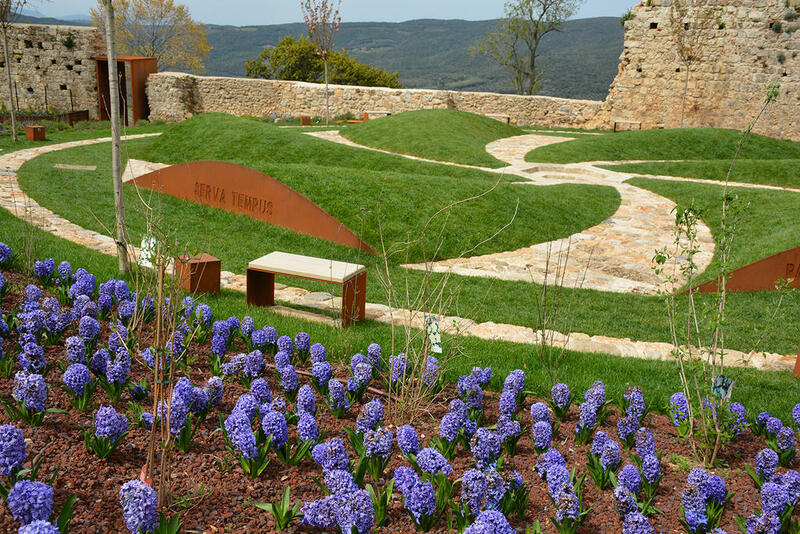 Based on careful research of the differences in height and of earth movement, of the moderate undulations of the terrain, and of the reuse of local stone, Maria Dompè develops a captivating landscape narrative. 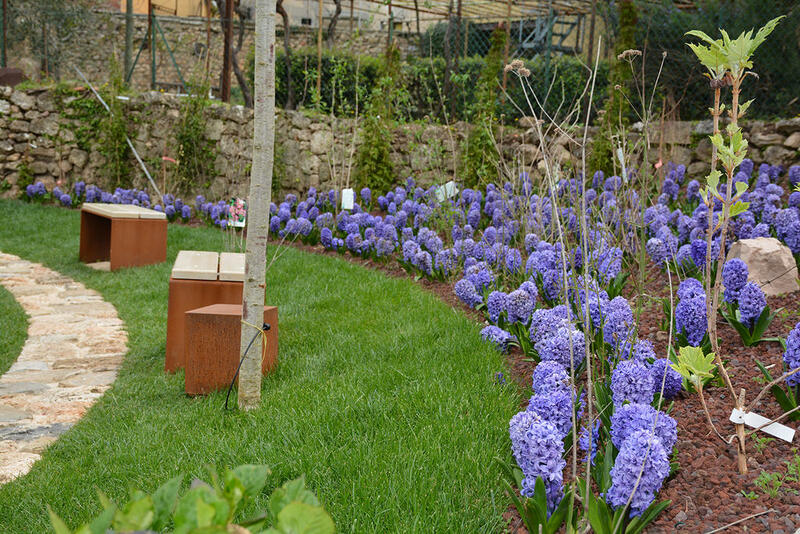 This experience is created by adding mystical sensory effects, which have both an aesthetic and auditory impact, as well as specific scents from Mediterranean plantings to the chromatic preciousness of seasonal flowering, including listening to music which is both both soothing and full of emotion. The artist has understood the language of the place, the stratification of time, alternating with current history the social and urban needs and, with convincing sensibility, has translated all of this into images, using a balanced lexicon of strength through simplicity. “SOL OMNIBUS LUCET”: the “sun shines for everyone,” which is an ancient saying that in the full length of human history has taken on different meanings. Taken in terms of today, it have a special significance, as an appeal to tolerance and hospitality towards the “stranger”: ideals of equality and of liberty: the defense of which has been a moral imperative for many, even to making the extreme sacrifice. This “green work” is, in fact, dedicated to Norma Parenti (gold medal for military valor), the young partisan, and a symbol for an entire community, who was killed by the German troops in 1944. The spiral is a very common pattern in nature, which recalls a circulation of evolved force. 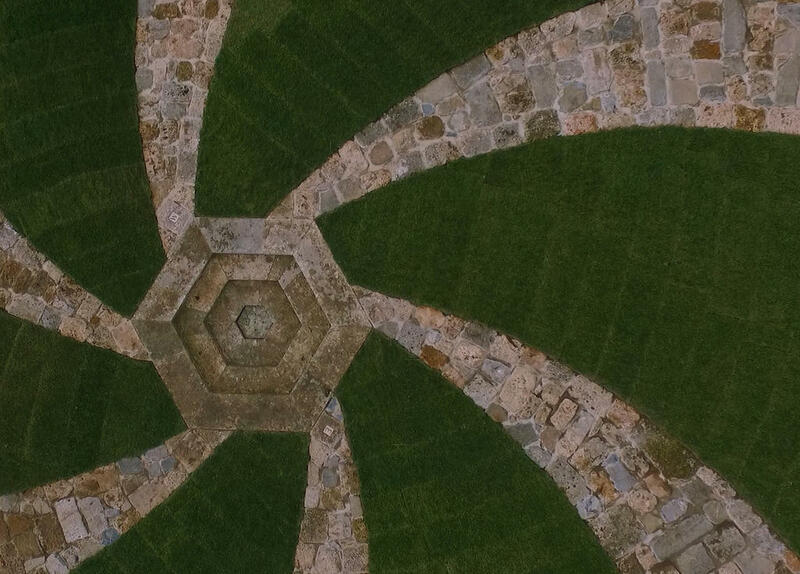 A kind of spiraling energy circle which develops centripetal trajectories determined by alternating paths either by bumps in the terrain, green shrubbery, or by paths paved by the native rock of the area. The visual movement of the earth, together with those in stone, creates a rhythmic undulation (symbolizing energy propagation). 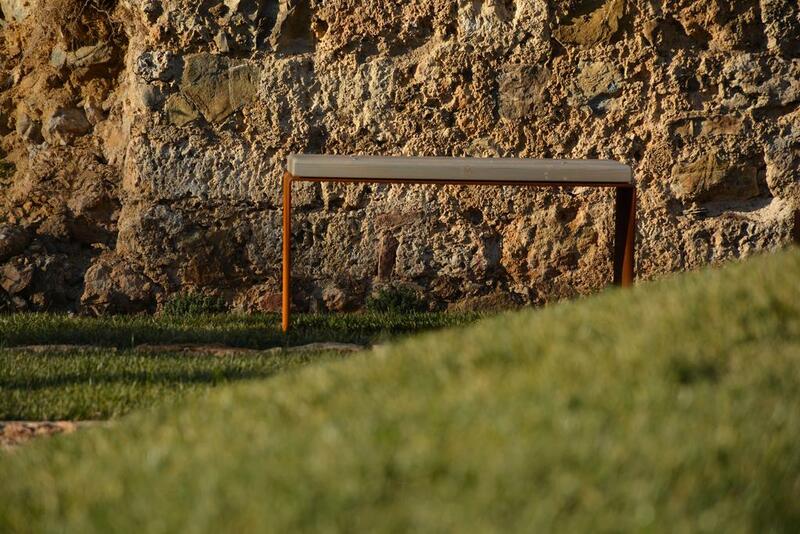 The modular appearance of the terrain are contained by Corten steel plates (a material, rust-like, that acquires individuality and aesthetic features over time); these plates are engraved with Latin mottoes, reinforcing the concept of ancient roots which are embedded in human knowledge. The center of the work, the fulcrum of the spiral motion, is marked by a geometric sculptural form, an archetype of symbolic value: the well from which humanity has always drawn the vital element. It is a metaphor in search of its history and its own roots, the core values of a community. 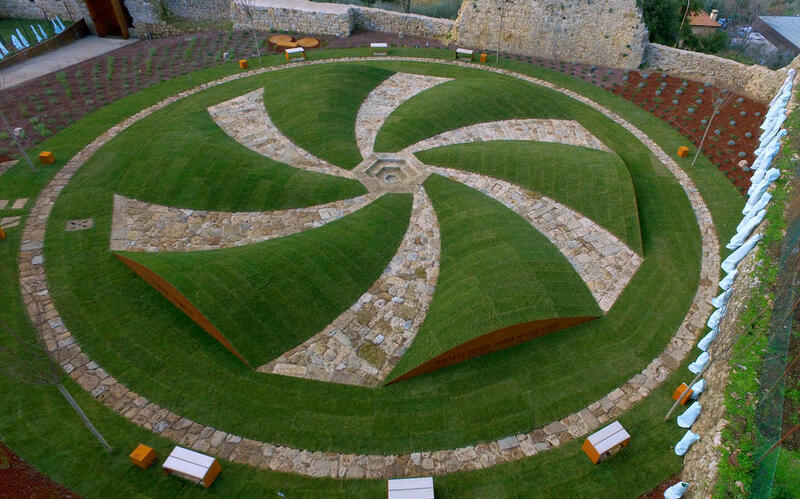 It is not a coincidence that the green work grows on an archeological site and that the circular movement of the spiral, along with the central element, ideally wedged into the roots, the stones, and entering into the viscera of the earth as if to draw strength from the layers of lived history. 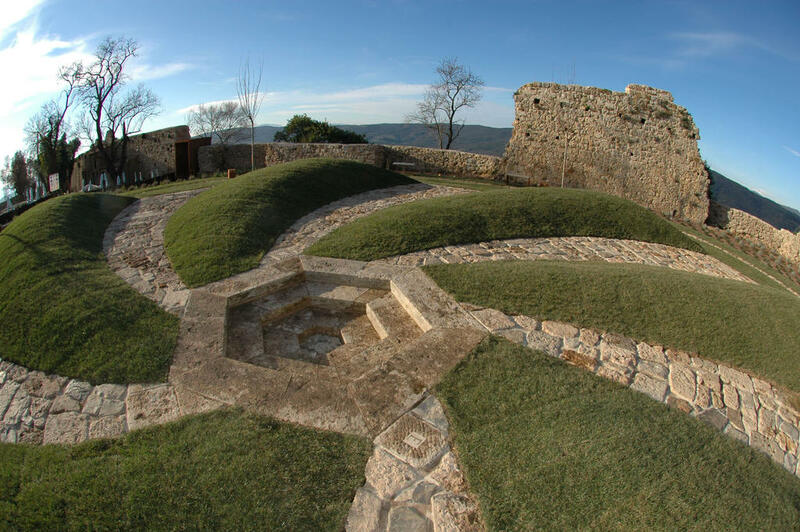 The hexagonal well, divided into sections by ancient stones, is orientated, geographically, east-west, in order to represent the cycle of life, symbolically connected to the daily solar evolution: east and west (hence the title: “sol omnibus lucet”). This is the allegory of time, or better, the temporal relation of man with nature. 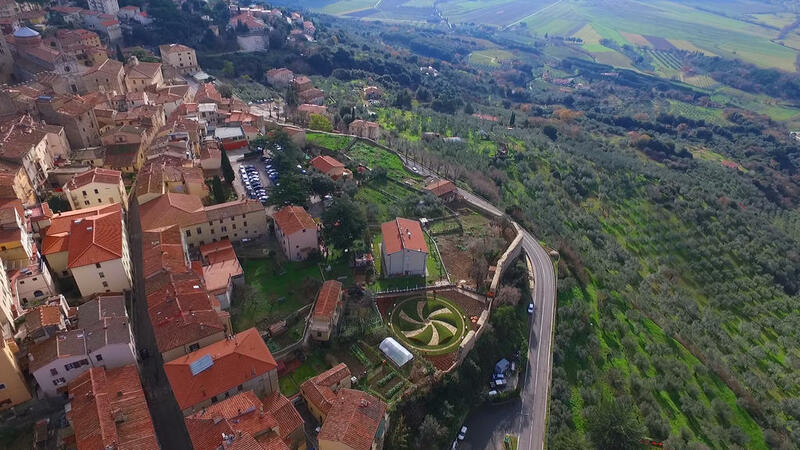 Some students of primary and secondary schools of Massa Marittima, the future citizenship, have been active promoters of the work with instructive guided tours during the construction phase. The students, however, were most deeply involved in the final stage when they inscribed some thoughts-desires on imperishable tablets which have been closed in a metal container and buried inside of the central sculpture; creating, therefore, a sort of wishing well dedicated to welcome and conserve for some years these childish aspirations, guarding them until on a future day when they will be shared with the entire community.